Three of the top five most exciting games of the NBA playoffs' first round came from a single series: Spurs-Clippers. The matchup, while having no business being in the first round (the #2 and #4 teams, according to my market rankings), nevertheless delivered with one of the most exciting seven game playoff series in recent memory. For this post, I have attempted to condense the drama of that series onto a single page. The chart below shows the Los Angeles Clippers' probability of winning the series on a play by play basis. Each game's win probability chart was adjusted to show its impact on the ultimate outcome of the series. On the chart, the lines are color coded based on location (red for Clippers home games, black for the Spurs). The Clipper began the series with a 37% win probability, a number that was derived from the opening point spread of Game 1. The Clippers were just 1.5 favorites at home to begin the series. Home court advantage in the playoffs is worth 3.75 points on average, implying that the market valued the Spurs to be 2.25 points better than the Clippers. This is why the Spurs opened the series as favorites despite not having home court advantage. Before each game, the implied market difference was recalculated based on the upcoming game's point spread and then used to recalculate series win probability. You can see the Clippers' probability dropped sharply between game 3 and 4 in an "after hours trading" of sorts. The game 3 line was 4 points in favor of the Spurs, but increased to six points for game 4, implying the market became more confident in the Spurs. 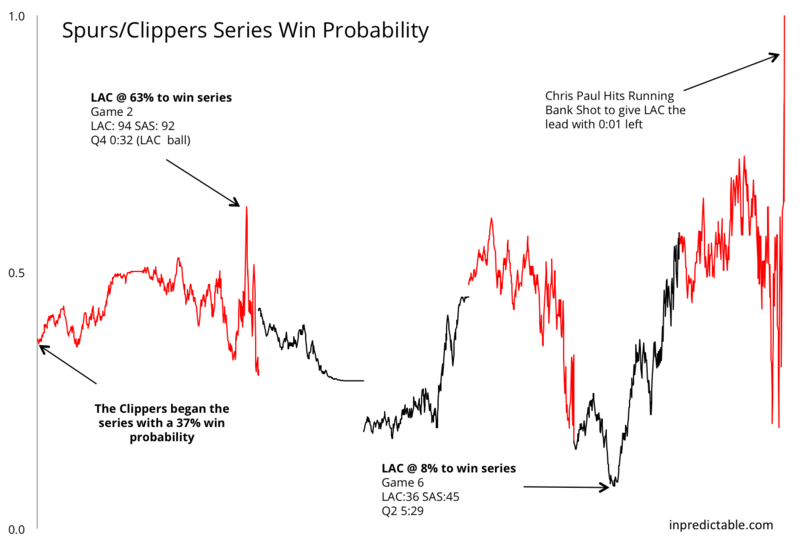 Early on, the Clippers series probability rose as high as 63% when they found themselves with a two point lead and the ball with just 32 seconds left in game 2. However, a Blake Griffin turnover and two Patty Mills free throws allowed the Spurs to force overtime and eventually escape Staples Center with a victory. The low point for the Clippers occurred in game six, in which the Clippers, down 3-2 in the series, also found themselves down by 9 points midway through the second quarter. But they erased that deficit by halftime en route to a victory that forced a game seven back in Los Angeles.